Abuela waits for a customer. 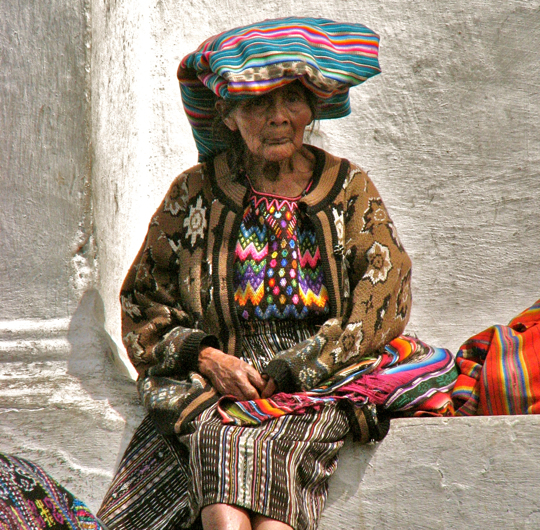 Sitting with patience and great dignity, this abuela (grandmother) waited for market-day customers on the steps of Chichicastenango's main church. She is probably K'iche', one of 22 ethnic subgroups within Guatemala's Maya population, and wears the traditional embroidered huipil (blouse), along with a beautifully woven corte (skirt). On her head, she carries a folded cloth called a tzute that can function as a shawl, scarf, or baby sling as well as a hat. She probably needed the shawl, since mornings are cool in these mountains. 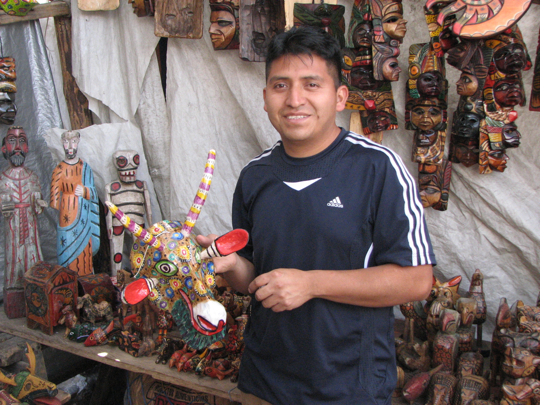 Markets are held in the plaza area of Chichicastenango on Thursdays and Sundays. Chichicastenago is in the mountains of the southern Guatemala highlands. 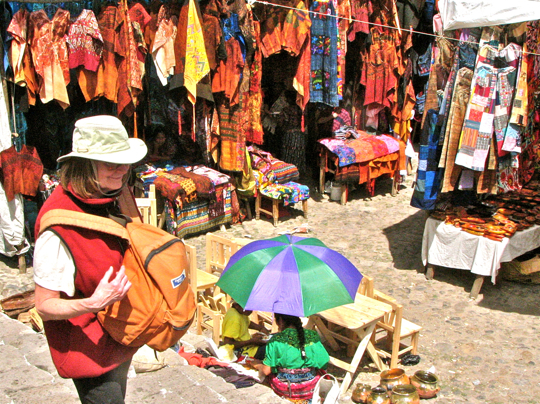 Chichicastenango, situated at 1,965m (6,447 ft), has been famous for its market since ancient times. That was why it was our first stop, about 3 hours (140k or 87 mi) after leaving Guatemala City on our Caravan Tour. It is also about a 1 hour drive north of Lake Atitlan. Chichicastenango is the name of the municipality (similar to county) and the city of Santo Tomás Chichicastenango is the municipal seat. There are about 107,000 people who live in the overall municipality, and more than 45,000 of those live in the city itself. 95% of them are K'iche' (also called Quiche) and the rest are Ladino, or mixed blood. For a map of the town, click here. Loading the chicken bus. Many of the market-day vendors and customers arrived on these garishly painted vehicles. 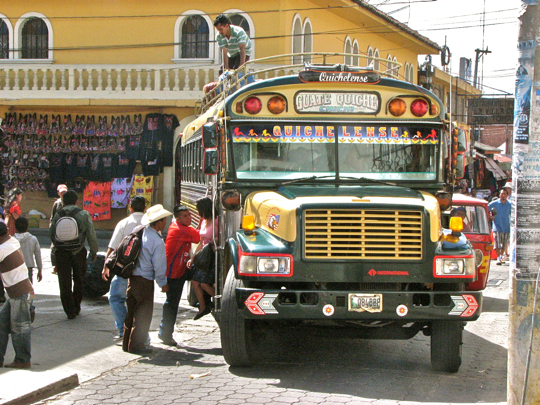 Some years back, enterprising Guatemalans went to the US and bought up obsolete school buses, drove them down, and turned them into intercity buses. The new owners painted them in multiple bright colors, layered on chrome wherever they could, and gave them fancy names. The bus above has a chrome luggage rack on the top where an assistant called a brocha (brush) sits while the bus does pickups. The brocha loads luggage, collects fares, and herds the passengers on when the bus is ready to leave. On the road, the drivers tend to be--how can I say it generously--overly daring. Once, while on a blind and precarious mountain curve, two chicken buses traveling bumper-to-bumper passed our tour bus going flat-out, obviously in a race. Jorge, our tour director, shook his head and mumbled under his breath. The wise put their affairs in order before spending much time on such buses. Why are they called chicken buses? Because, generally, no livestock is allowed in the passenger compartment, unless it is small enough to fit on one's lap. According to Jorge, the chicken buses will be phased out in the next few years in favor of a more modern transportation system. The intra-city options. 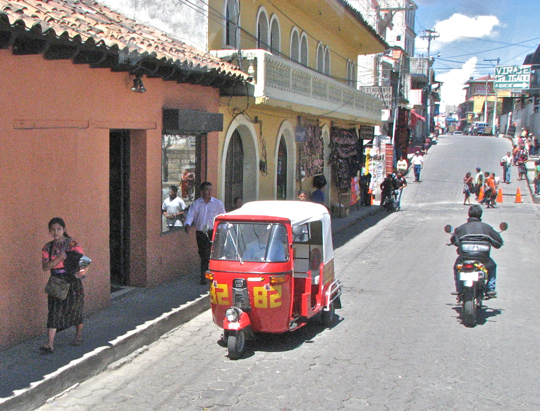 To get around in Chichicastenagno, and most other towns in Guatemala, 3 popular choices are walking, riding a motorbike, or using one of these little 3-wheeled taxis. Called tuk-tuks because of the sound of their motor, they are fast, cheap, reliable, and everywhere. Tuk-tuks originated in Bangkok and someone had the bright idea of bringing them to Guatemala. They were an instant hit. You should always make sure you have settled the fare amount before climbing aboard, however. While on foot, you should also always keep an eye out for tuk-tuks, because their drivers tend to dart for any open space in traffic. Carole prepares to brave the market. The wise keep close track of their valuables in a market like this, because pick-pockets are a more-than-likely presence. Carole wears her daypack on the front for this reason. At such stops, Jorge urged his passengers to leave passports and other important documents on the bus, which was then locked and guarded by the driver. Money can be easily replaced, but a lost passport in a foreign country creates a serious problem. Either through luck or careful attention, we never had a theft, although there were 42 people in our tour and we made many stops. 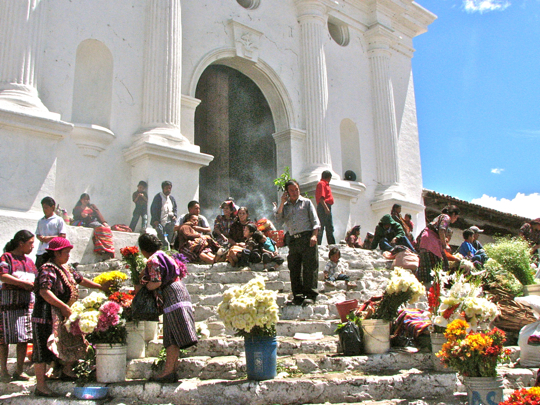 The steps of Iglesia Santo Tomás are a favorite spot for flower sellers at the market. The church is more than 400 years old, and is built on top of an ancient Maya temple, a typical practice of the Spanish conquistadors. The 18 steps seen above were part of the original temple. Each step represents one month of the Maya calendar year. At the top of the steps in front of the entrance you can see smoke rising from burning copal incense. Since the use of incense was a sacred practice common to both the ancient Maya and the Catholic Church, the Spanish priests easily adapted copal into their rituals, one of many parts of Maya religion they attempted to coopt. In turn, priests of the Maya religion still use the church for some of their old rituals. The mixture of practice is fascinating. We weren't allowed to photograph the dim and mysterious inside of the church, but were able to view it and some of the rituals occurring there. As copal incense drifted in from the front steps, male members of the cofradia (brotherhood) moved about inside, dressed in traditional clothing and carrying emblems of their authority, long staffs with elaborate silver ornaments on top. Tiny Maya women moved up the aisles on their knees, an inch at a time, while they softly chanted. Carole was entranced, saying later that she felt she had wandered into the 16th Century. Closing the deal. The Maya are some of the most enterprising people I have ever seen. 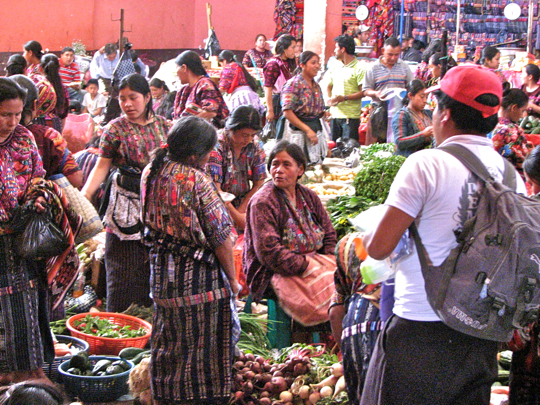 Market day is a major economic opportunity for them, especially since Chichicastenango has been "discovered" in recent years. 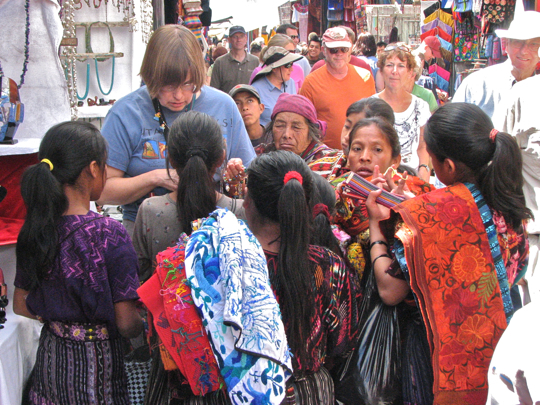 We were not the only tourists looking for an exotic experience and local crafts. Above, a young girl of about 7 years is deep in negotiation with a European man. She wears the traditional huipil and corte, although some of the children I saw were wearing more modern styles. Two Maya boys in the back ground were closely monitoring her progress. A flower seller surveys her prospects. From the steps one could look over much of the market spread out below. The plaza was completely covered by booths crammed with goods and separated by narrow aisles mobbed with people. 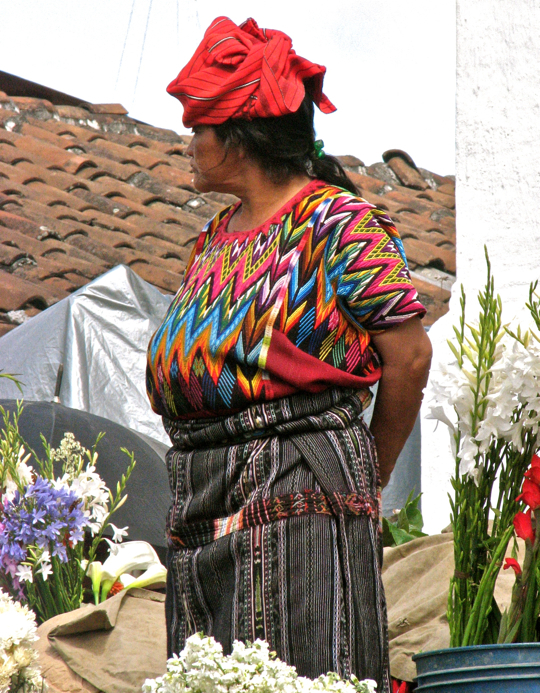 The flower seller wears a huipil embroidered with a striking, multi-colored zig zag design. The huipil is typically (but not always) tucked into the corte, which is wrapped about the waist somewhat like a Southeast Asian sarong. Sometimes a sash, called a cinta is worn around the waist. On her head she wears a flaming red tzute. 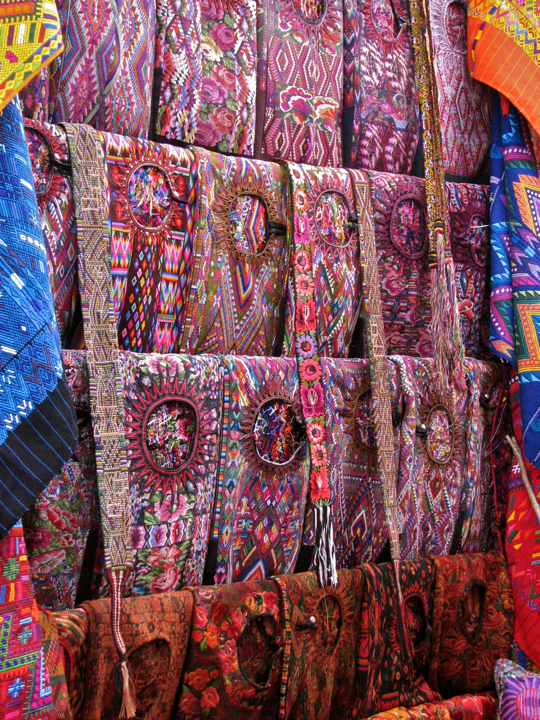 Some of Guatemala's world-famous textiles. 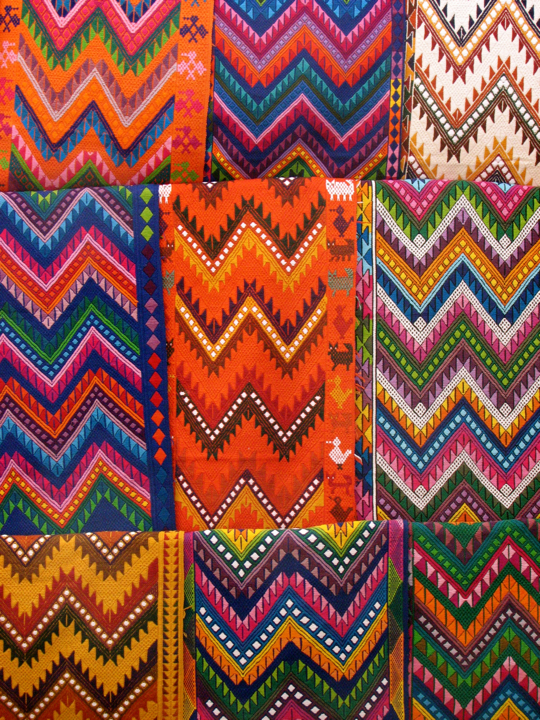 Notice the zig zag patterns, similar to those worn by the flower seller. 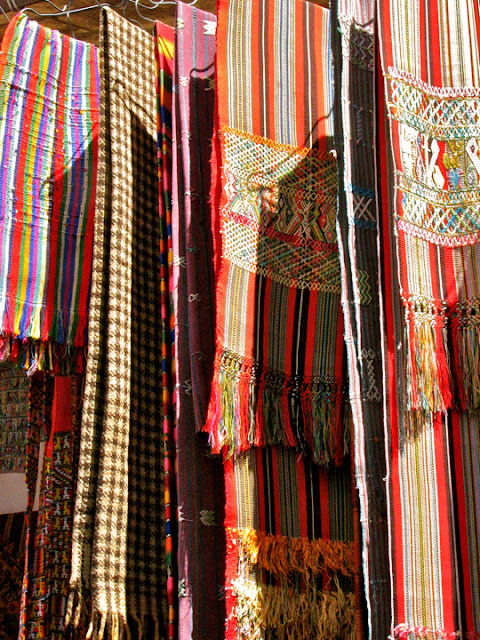 These fabrics may have been created on a back-strap loom, one of the most ancient techniques still used in the world. I have visited archaeological sites with pictures more than 1000 years old that show women using backstrap looms. Alternatively, the textiles above may have been woven on a foot-powered treadle loom, a 16th Century innovation of the Spanish. Such looms are often held together with wooden dowels and twine, with little or no metal in the machine. They are still widely used in Guatemala and Mexico. Pots for sale. 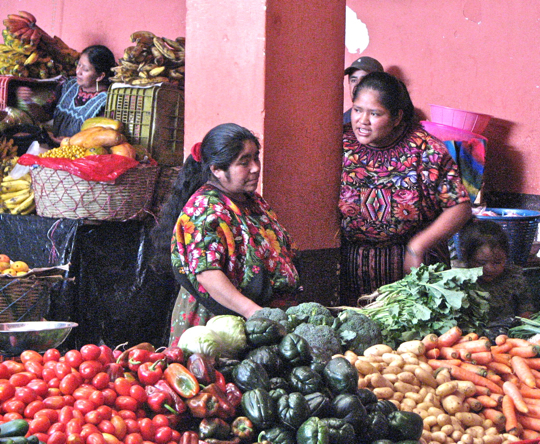 A Maya mother and her young daughter negotiate with a local shopper. How she manages to keep the crowds from trampling her wares on the old cobblestone street is a mystery to me. The Maya have been crafting beautiful pots for 3500 years or more. 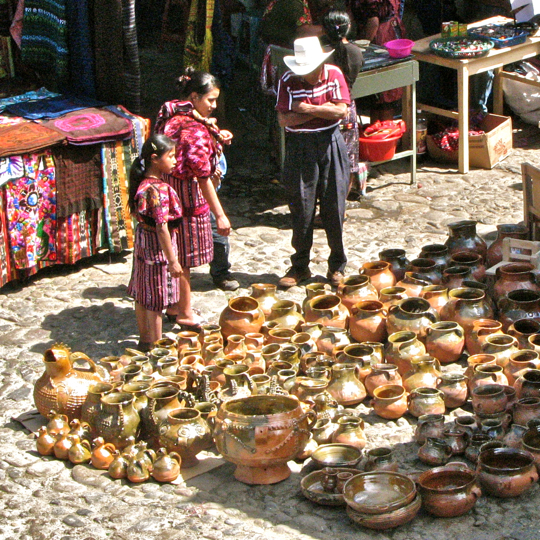 To make pots like those above, the potters will find the necessary clay in the river bottoms of highland mountain streams that have produced materials for similar wares since Olmec times. The metamorphic and igneous rock, as well as volcanic pumice, produce the temper which strengthens the pot. With 37 volcanoes, Guatemala produces a lot of tempering material. While modern Maya generally use a potter's wheel, in ancient times they used the coil and slab techniques. After forming, shaping, inscribing and painting, the pots are left to dry and then fired in open air kilns. Maya have also been making and using masks from the earliest times. Masks were used for ceremonies and dances, as well as for burials and sometimes as ornamentation for buildings. The wealthier Maya, and the nobility, could afford much more elaborate masks. One of the most famous Maya masks is the one found in the tomb of Pakal, the great king of Palenque. Covering the dead king's face, the mask was made entirely of jade. The poorer classes used carved wood, or even pieces of bark with slits cut for eyeholes. The masks sometimes represented human faces, but more often were of animals including jaguar, deer, and birds. After the arrival of the Spanish, masks with pink faces and blonde beards appeared, as well as those with the faces of cattle. 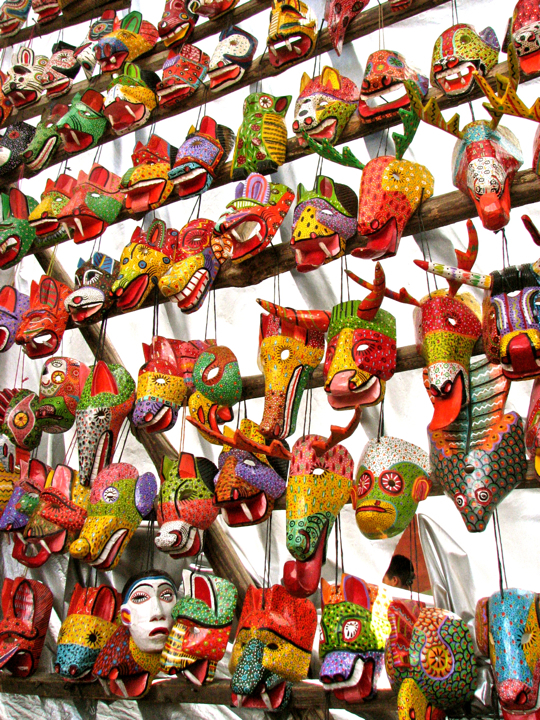 While in Chichicastenango, Carole added to our growing mask collection by purchasing one from the shop shown above. It has the wonderfully huge beak of a toucan bird. The maker of Carole's new mask shows off another recent creation. He was an easy-going young guy who was happy to pose for a photo after his sale to us. The mask he holds has the face of a rather startled-looking cow. There were a large number of mask booths, so it was hard to make a choice for our collection. In fact, I got so many good photos of masks, it was hard to make choices for this posting. The immoveable meets the irresistible. Stopping to examine the wares or listen to the pitch of a street seller meant an almost instant mob scene as many more appeared, all appealing for your attention. Jorge pointed out that if we didn't want to be mobbed, we should patronize those merchants who had a regular booth. Some tourists just liked to test their skills with the street sellers. In fact, Carole observed that many in our party were truly serious shoppers and were well matched with these determined sellers. At one point Jorge tried to separate the shoppers from the sellers so he could give instructions to the group. In moments, they were joined again in jovial combat. Jorge finally rolled his eyes, threw up his hands, and gave up. An eye-catching combination. 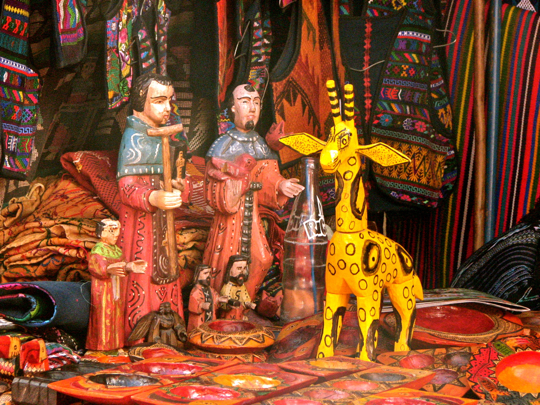 When passing this booth, my eye was caught first by the odd juxtaposition of two be-robed saints with a jaunty yellow giraffe. Then I noticed, even more incongruously, someone had left a glass soda bottle between them. I couldn't resist the shot, particularly with the richly colored background. More gorgeous textiles. Booth after booth contained textiles of such rich color and design that it was almost overwhelming to the eye. Like the mask shops, I ended up with far more textile pictures than I could use and it was a tough choice to pick the ones for my blog. More bargaining. Notice the contrast in dress. The young European girl is showing far more skin that you would ever see from a Maya woman. 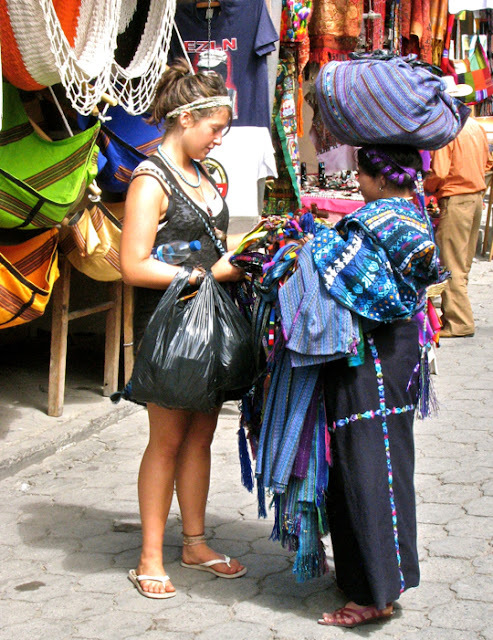 The seller, by contrast, is almost buried in the clothes she is wearing and the products she is carrying. Notice the seller's skirt. The embroidered cross indicates she is a married woman. A horizontal band without the vertical cross would indicate single status. Huipils, ready to wear. A huipil (pronounced wee-peel) is a rectangular piece of cloth with a hole in the middle for the head. It is worn like a poncho, and falls to below the waist. Sometimes the sides are sewn up leaving space for the arms and sometimes they are left open. 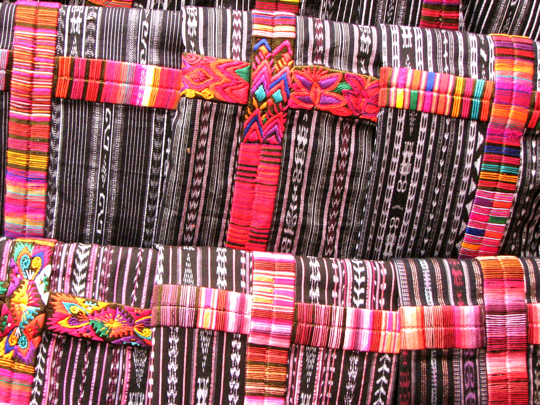 Usually Guatemalan huipils are richly embroidered like the ones above, although the embroidered part doesn't generally extend to below the waist since that part will be covered by the corte. 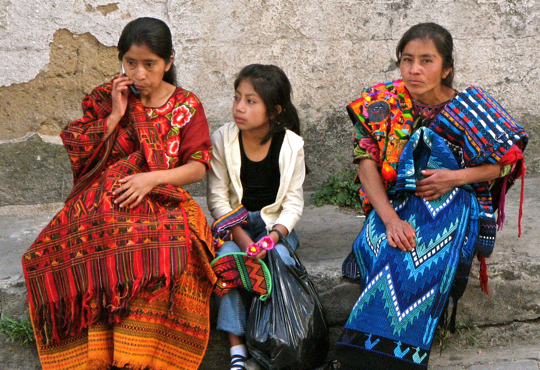 I wondered if Guatemalan women only wore them for special occasions or even just to dress up for the tourists. Later, I looked out my bus window as we traveled through the countryside and saw women working with hoes on steeply terraced hillsides while wearing their beautiful huipils. Closeup of marital cortes. Here, you can clearly see the crosses on a group of cortes that indicate the woman who will buy them is married. The underlying pattern appears to always be vertical with dark, muted colors, while the horizontal and vertical bands are always brightly colored, often with intricate designs. A visit to the food market. While wandering about, I discovered this indoor food market, jammed with Maya women and a handful of men. And, of course, me--the lone gringo. I took the opportunity to get as many candid shots as I could, while trying to be inconspicuous. That is, as inconspicuous as someone can be when you are blonde, light-skinned, 12 inches taller than everyone else, and wearing clothes that are shockingly different than most people around you. Chatting over vegetables. The woman on the right appears to be sharing a delicious secret, while the one on the left looks skeptical. By standing slightly behind a pillar and using my telephoto zoom, I caught this pair in a pose that wouldn't have been out of place in a US supermarket. Some things are universal. The fruits and vegetables looked scrumptious. Not so likely in a US supermarket. 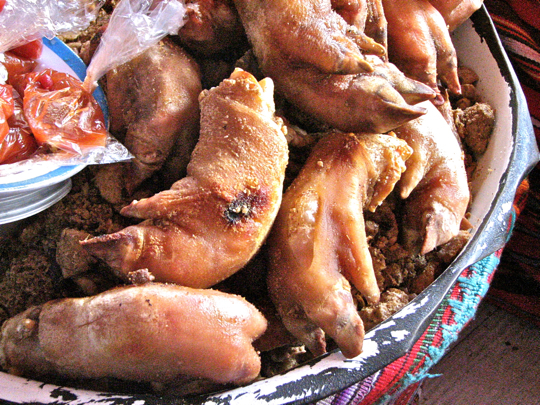 Pigs feet, anyone? I delight in the unusual culinary choices one finds in traditional Latin American food markets. It would appear that the Maya use every part of the pig but the oink. Hotel Santo Tomás provided a welcome respite from the glare of the mid-day sun. 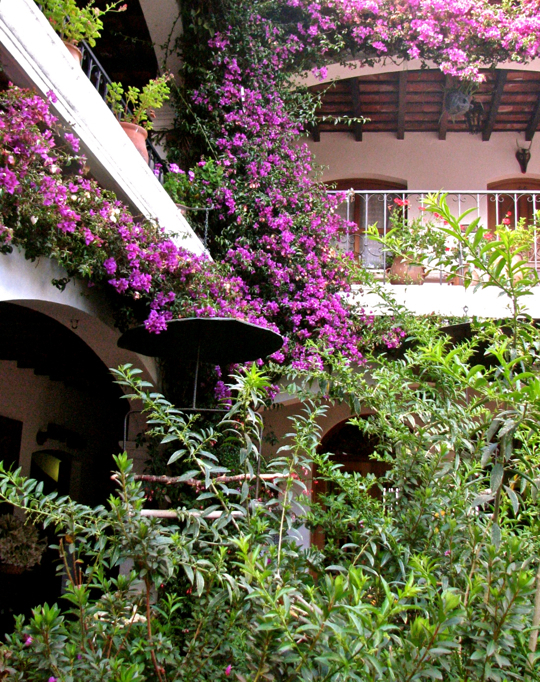 The Hotel Santo Tomás, only a couple of blocks from the center of the market, is a cool refuge of lush courtyards filled with climbing banks of flowering plants surrounding burbling fountains. "Where's my pirate?" 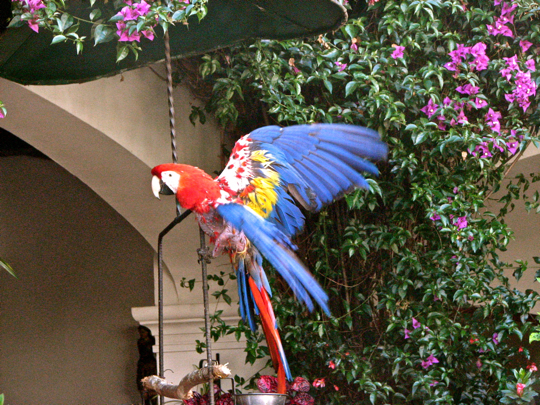 Brilliantly colored parrots fluttered around the hotel courtyard. Guatemala is home to 735 species of birds, including this gorgeous parrot. In ancient times, parrot feathers from Guatemala were traded for turquoise from the Anasazi civilization of the Southwest US. The ancient and modern co-exist in Guatemala, at least for now. These three were sitting across the street from the Hotel Santo Tomás just before we boarded our bus. The women are dressed traditionally and carry textiles made from traditional designs. Modernity is creeping in however. The young girl wears a more modern outfit, and the woman on the left has a cell phone pressed to her ear. If the young people of Guatemala abandon traditional customs for the dubious benefits of modern styles, the gloriously complex and age-old traditions of Guatemala's Maya may fade and largely disappear in a generation or two. At this point, Guatemala is one of the most heavily penetrated societies by cell phones companies. More than 50% of the population owns one. Other modern ways are rapidly spreading. 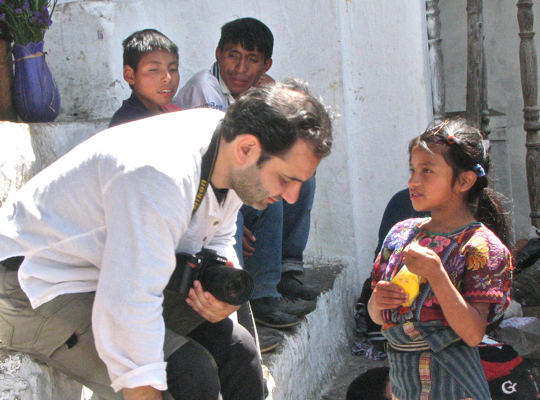 This completes Part 3 of my Guatemala series. There is much more to come, so hold on to your hats. Our next stop will be the stunningly beautiful Lake Atitlan. I welcome feedback from my viewers. If you would like to leave a comment, please use the Comments section below, or email me directly. What a visual feast you have created with your photos. Every one was stunning and I had to enlarge each and treat my eyes to all the color and detail. 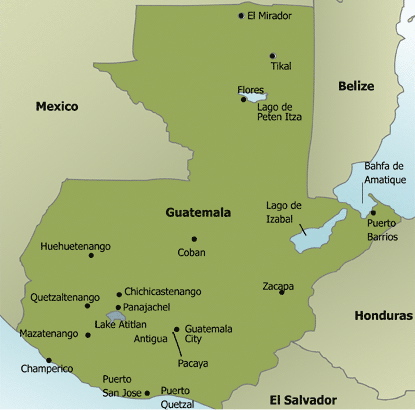 I live in northern coastal Mexico and your post really made me want to venture south and explore Guatemala. jim, i'm loving your postings about guatemala so much that i just made my own blog post today about your blog. hopefully some new readers will visit your site to enjoy it as i am! Very nice photos. The first one in the series - la Abuela - is simply gorgeous. I love the composition, and the expression in her hands. You've really shown the beauty of this woman.